After an extremely busy term at school it was time for Easter and for most people, a nice relaxing 2 week holiday. Somehow things don't often work out like this for me, as I had decided to join a team to race in the Godzone Adventure Race - a 5 day race starting in Queenstown, New Zealand. Leading up to the race things were hectic - Chris was also racing for his team Seagate and he was busy trying to organise himself and me. We had stuff all over Chris's parents house, bike boxes and paddle gear were exploding out the door! Meanwhile I was desperately typing up thousand word essays in amoungst thinking about what food I could possibly eat for 5 days and what shoes should I wear!?! We've been back in New Zealand for 5 months now and I haven't managed a single post! The shame! The trouble is not lack of fun trips to write about, it's lack of time afterwards to do it! I have started studying again and seem to find zero spare seconds in my day. Nevertheless, I am determined to do some trip posts again. 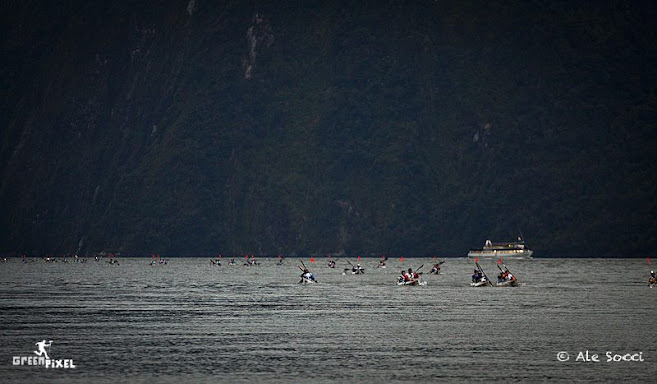 Since Christmas there have been several 'highlight' trips, one being a 5 day sea kayak adventure we did in Marlborough Sounds, another was a week's mountain bike orienteering carnival down in central Otago. But the one which I really want to write about on here was an amazing trip I did up Cloudy Peak with my friends Grieg and Clare.